Next to our patients, our patients' friends and family members are the most important people we know. Spending time with someone who cares during a hospital stay stimulates smiles and lifts spirits – on both sides of the hospital bed. That's why we encourage visitors to come see us, sit, and stay awhile; it's a healthy experience for everyone. Hillside Rehabilitation Hospital is a 69-bed medical rehabilitation hospital designed to treat the inpatient and outpatient needs of individuals who have experienced a disabling injury or illness. A physician-directed interdisciplinary team works with each patient and his or her family to provide an individualized rehabilitation treatment plan. Hillside Rehabilitation Hospital is about people – the patients and families we serve and our outstanding staff who provide the very best medical care. Our physicians, physician’s assistants, nurses, therapists, and the entire team are truly dedicated to the wellbeing and dignity of our patients. At Hillside Rehabilitation Hospital, we strive to serve the needs of our communities by delivering the highest quality of care with compassion and respect. We dedicate ourselves to the communities we serve to deliver affordable health care to all and being responsible partners. 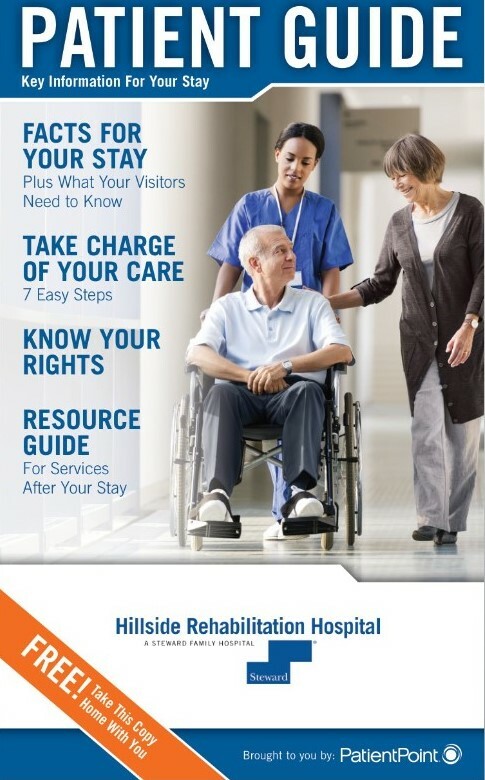 Our Patient Guide Provides Everything You Need to Know about Your Stay at Hillside!